Rural areas in Europe, which are facing unprecedented abandonment, "offer relevant opportunities" for migrant integration, according to analysis by a researcher at the European University Institute. At the same time that Europe is experiencing an increased migrant influx, in large part due to the catastrophic siutation in parts of the Middle East, its rural areas are undergoing unprecedented levels of abandonment and depopulation. This is leaving some regions with a lack of manpower and insufficient generational turnover. According to Michele Nori, a Marie Curie research fellow from the European University, "the rural world offers relevant opportunities" for sustainable integration of new migrant arrivals in Europe. Nori's study, published on the population demographics research website Neodemos, analyses the relationships between rural depopulation and the increase in foreign workers working in farming, and suggests ways to make them compatible. Nori argues that the restructuring that has characterized the farming industry in recent decades has "contributed to polarising (geographic) areas and widening inequalities within." Socio-economic indicators "show that those who live in the country have an income that is on average 40 percent less than those who live in cities. They also have fewer services and basic infrastructure, have limited professional and cultural opportunities, and live in demographically older communities." The analysis said these factors "make the European countryside less attractive to young people." Nori said the significant influx of migrants has contributed to counterbalancing this rural exodus, making up for the gaps resulting from local demographic shifts. Nowadays both documented and undocumented foreign workers in many European rural areas "make up a growing component of the agricultural work force and make up a significant portion of a local village's residents," Nori said. In any sector or geographic area, "migrants provide a valuable contribution to the production chain of various products." Nori emphasized that despite this, rural areas have "significant dimensions of invisibility and informality," making the sector "preferred for undocumented migrants without visas or permits, which contributes to generating conditions for widespread exploitation practices." In particular, he said foreign workers operating in this context frequently report "illegal conditions, lack of contracts, instability, limited rights, low pay, late payments, and maltreatment." In terms of initiatives that could facilitate improved interactions between the rural world and migratory dynamics, Nori suggests "the establishment of trustworthy platforms for managing the rural labour market, an observatory for monitoring the abandonment of agricultural lands to facilitate its transfer for use by Italian or foreign young people, and organizing professional and business training." 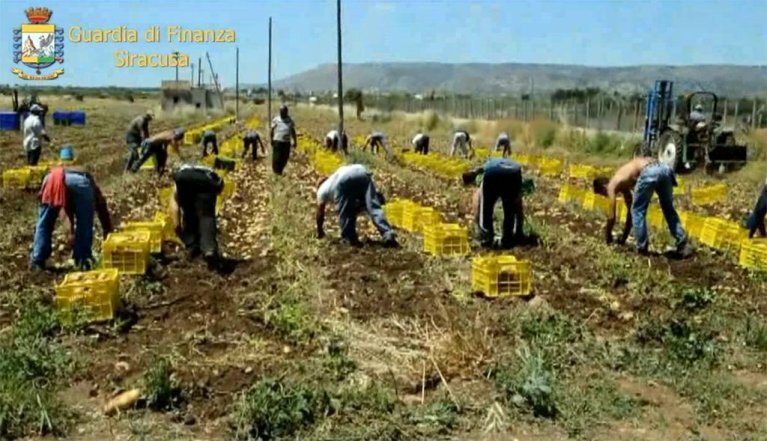 (Picture shows migrants working in a field in Sicily.Photo/Archive/Tax Police press office).